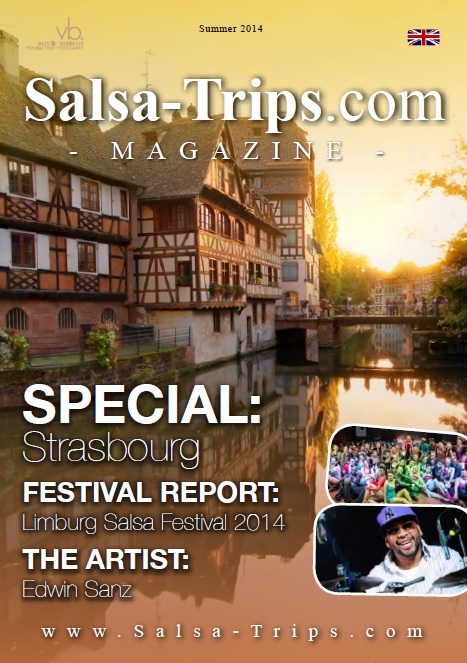 Welcome to the Summer edition of the Salsa-Trips.com Magazine. Let yourself be carried away to Strasbourg – one of the most interesting cities in Europe. Classified as “World Heritage” by UNESCO, Strasbourg is a city with a very high quality of life and an intense cultural life. From October 30th, the Zénith in Strasbourg also hosts the 2nd International Salsa Kings Festival. Coming from the North, as review, we brought some memorable impressions from the Limburg Salsa Festival, held mid of May near Maastricht. Thanks to the efforts of Michael Beyer, we were able to review an album even before its’ release date and provide the latest information about the artist Edwin Sanz. Beside this brand new recommendation, you will find the tips of DJ Mambito and DJ El Chino as well as the Event Manager at the end of this edition. You may also recognize the ads from some of our partners. We started to build a broad distribution of the magazine besides the festivals and major events. Interesting? Then you may become our partner for your city and neighborhoods.